Be sure to stop by and and say HI! As well as posting/reciprocating the linky! Hey everyone, today we're going to feature some crafty makers on my blog. These ladies have some awesome ideas and items that I wanted to share. Be stop by and take peek and maybe make a sweet purchase on some great OOAK deals! 6) Goodies By Greiner: www.etsy.com/listing/77250400 Celebrate the summer and a GREAT Catch with your favorite FisherMan or FisherWoman! 7) Strickly Cute Creation: www.etsy.com/listing/80484265 Bring a little sunshine to the end of summer! I've been MIA for the past month or so, mainly because I had been taking an online class. Just finished my final exam and turned it in so I am DONE! That's until next term, but in any case I now can utilize my weekends to start creating jewelry again. To celebrate finishing my class I wanted to share with all of you a couple of necklaces that you can wear on a night out to celebrate. Here is the Gracie Necklace. Elegant and classical, this illusion necklace is made with white & sage pearls and separated with a sparkling sage roundel spacer. 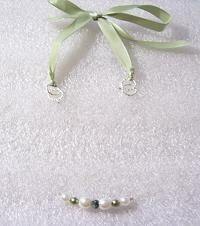 This necklace is adjustable to any length with a sage ribbon and connected with silver twisted rings. 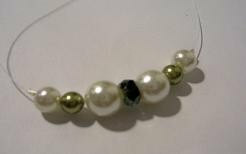 Once worn it adorns your neck quite nicely presenting an an illusion of floating beads. Or for a fun and sophisticated night out, you'll enjoy our Swarovski Baroque Necklace. Night time elegance at its best! This 22x15mm Baroque Pendant dangles on a silver chain that linked alternately with 1mm swarovski bicone beads. Fabulous for weddings, dinners, and any special bow-tie event! Other fun and unique pieces can be found at Simply Shop|323!